Angoss provides a broad suite of analytical tools and solutions which cover predictive analytics, text analytics, document exploration, scorecards and advanced modelling in an integrated environment. It has recently expanded the capability of its products considerably to meet general model building needs and provide model management capabilities. 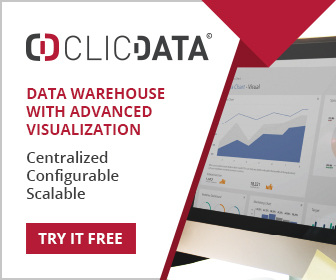 It is truly an enterprise solution for analytical needs, providing the infrastructure and management controls necessary to deploy predictive models into a production environment. Angoss provides an analytics platform of considerable breadth and capability, and joins an elite group of no more than five suppliers who truly offer enterprise capability. Angoss delivers its capability through several modules, addressing different types of analysis and function within the enterprise. KnowledgeSEEKER is a data mining and predictive analytics platform supporting the full development lifecycle. This includes data preparation, workflow automation, support for R, best-in-class decision trees, and in-database analytics for big data, if desired. The decision trees are worthy of special mention, being highly graphical in nature and amendable to manipulation by skilled business users as well as analysts and data scientists. It also provides unique (patent pending) Strategy Trees which integrate business rules with predictive models in a single graphical tree. KnowledgeSTUDIO supports modelling and scorecard development, with workflow automation, linear and logistic regression, neural networks, cluster analysis, principal component analysis, market basket analysis (association rules), scorecards and provides support for R and in-database execution of models. KnowledgeREADER is a text analytics platform ideal for sentiment and theme analysis. It supports decision and strategy trees, and can be used for trend analysis, association discovery, document exploration and other forms of text analytics. KnowledgeCORE is an advanced modelling platform which allows users to custom code in the language of SAS, R and SQL languages. It covers the complete model lifecycle with data preparation, data import and export, data profiling, model evaluation, and workflow automation. As with the other modules it also supports in-database execution of analytical models. KnowledgeCLOUD provides an analytical capability as a cloud service, and fully managed and hosted solutions are also available. This includes KnowledgeSCORE for predictive lead and opportunity scoring in sales, FundGUARD for asset management, and ClaimGuard for claims fraud. Real-time scoring can also be executed within KnowledegCLOUD. The development of capability within all these modules is rapid. Angoss will be introducing ensemble methods into its algorithm portfolio, and specifically Random Forest in late August. Also included in the August release will be associated techniques such as bagging, bootstrapping, and boosting. This will extend the capability of the platform quite considerably. 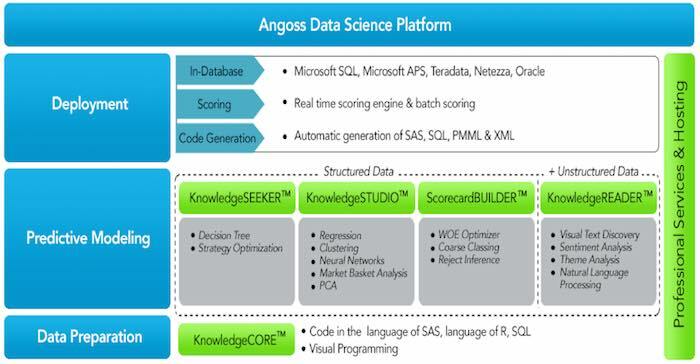 The platform accommodates all types of users, and with a planned mid-June launch of Tableau integration within current data science platform, Angoss aims to extend its features by providing users with easy-to-use data visualisation capabilities. The platform can be deployed for single user on a desktop, as a multi-user client/server environment, or as a cloud service. Future developments include a full predictive model management environment, model deployment optimisation (deciding which model to deploy in which circumstances) and templates which provide solution blueprints. Angoss has provided analytic tools for over 20 years and has a strong presence in financial services. It is an innovator as well as a supplier of analytical tools, and its strategy trees are universally well received. The company is headquartered in Toronto, Canada.